I started trying Theano today and wanted to use the GPU (NVIDIA GeForce GT 750M 2048 MB) on my Mac. Here’s a brief instruction on how to use the GPU on Mac, largely following the instructions from http://deeplearning.net/software/theano/install.html#mac-os. 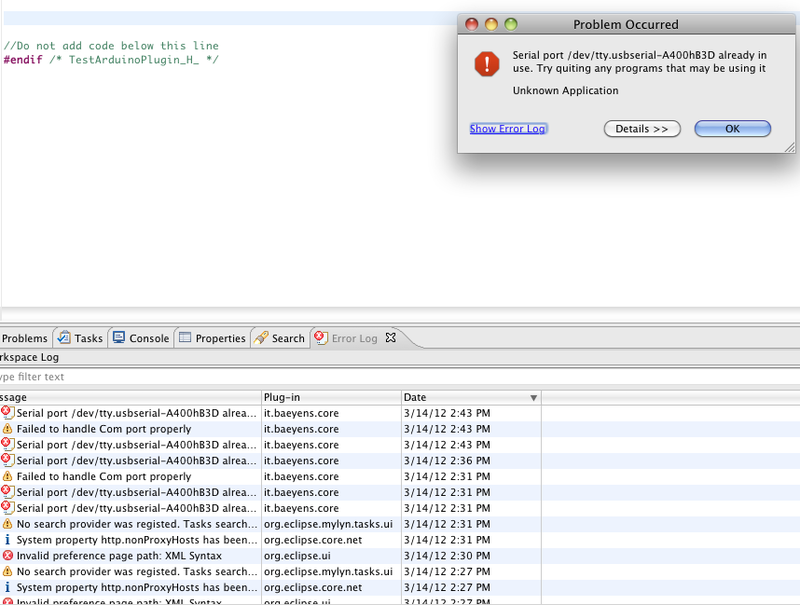 ERROR (theano.sandbox.cuda): nvcc compiler not found on $PATH. Check your nvcc installation and try again. [ 1. 1. 0. 1. 0. 0. 0. 0. 0. 1. 1. 0. 0. 0. 0. 0. 0. 1. 1. 0. 0. 1. 0. 0. 1. 1. 0. 1. 1. 1. 1. 0. 1. 1. 0. 1. 0. 0. 0. 0. 0. 1. 0. 0. 0. 1. 1. 0. 1. 1. 1. 0. 1. 0. 0. 0. 0. 0. 0. 1. 0. 1. 0. 0. 0. 1. 1. 1. 0. 0. 1. 1. 1. 1. 0. 0. 0. 1. 0. 0. 1. 1. 0. 0. 1. 1. 1. 1. 0. 1. 0. 0. 0. 0. 1. 0. 0. 1. 1. 1. 0. 0. 1. 1. 1. 1. 1. 1. 1. 1. 1. 1. 0. 1. 1. 0. 0. 1. 0. 0. 0. 1. 0. 1. 1. 1. 1. 0. 0. 1. 0. 1. 1. 1. 1. 1. 1. 1. 1. 1. 0. 1. 1. 0. 1. 0. 1. 1. 0. 0. 0. 0. 0. 0. 0. 0. 0. 0. 0. 1. 0. 0. 1. 0. 1. 0. 0. 1. 0. 0. 1. 1. 1. 1. 0. 1. 0. 0. 1. 0. 0. 0. 1. 1. 1. 1. 1. 1. 1. 0. 1. 1. 1. 0. 1. 0. 1. 0. 0. 1. 1. 0. 0. 1. 0. 0. 0. 0. 0. 0. 0. 1. 0. 1. 0. 1. 1. 0. 1. 1. 1. 0. 0. 1. 1. 1. 1. 0. 0. 0. 1. 1. 0. 0. 1. 0. 0. 0. 0. 1. 1. 1. 0. 1. 1. 1. 0. 1. 0. 0. 0. 0. 0. 1. 1. 1. 1. 1. 1. 0. 0. 1. 1. 1. 0. 1. 0. 1. 0. 1. 1. 0. 0. 0. 1. 1. 0. 0. 1. 0. 0. 0. 0. 1. 0. 0. 0. 1. 0. 1. 0. 1. 1. 0. 1. 1. 0. 0. 0. 0. 1. 0. 0. 0. 0. 1. 0. 1. 0. 0. 1. 1. 0. 0. 1. 1. 0. 1. 0. 1. 0. 0. 1. 1. 0. 1. 1. 0. 0. 1. 1. 0. 0. 1. 0. 1. 1. 0. 0. 0. 1. 0. 0. 0. 1. 0. 0. 0. 0. 1. 1. 0. 1. 1. 1. 0. 1. 1. 1. 1. 1. 0. 0. 1. 0. 0. 0. 0. 1. 1. 0. 0. 0. 0. 0. 1. 1. 1. 0. 1. 1. 1. 0. 0. 0. 0. 1. 1. 1. 0. 0. 0. 0. 1. 0. 0. [ 1. 0. 0. 0. 0. 1. 0. 0. 1. 1. 0. 0. 1. 1. 0. 0. 1. 1. 0. 0. 0. 1. 1. 0. 1. 1. 1. 0. 0. 1. 1. 1. 1. 1. 1. 0. 0. 1. 0. 0. 1. 1. 0. 0. 1. 1. 0. 1. 0. 1. 1. 0. 1. 1. 1. 0. 1. 1. 0. 0. 0. 1. 1. 1. 1. 1. 0. 0. 1. 1. 0. 1. 1. 1. 1. 0. 1. 1. 0. 1. 1. 1. 0. 0. 0. 1. 1. 0. 0. 0. 1. 0. 1. 0. 0. 0. 0. 1. 1. 1. 1. 0. 0. 1. 0. 1. 0. 1. 1. 0. 1. 1. 0. 0. 0. 0. 1. 0. 0. 1. 0. 0. 0. 1. 0. 1. 1. 1. 0. 0. 0. 1. 0. 1. 0. 1. 0. 1. 1. 1. 1. 1. 0. 1. 1. 0. 1. 1. 0. 0. 1. 0. 1. 0. 0. 1. 0. 0. 1. 0. 0. 0. 1. 0. 0. 1. 1. 1. 1. 0. 0. 0. 1. 1. 1. 0. 1. 0. 0. 1. 1. 1. 1. 1. 1. 1. 1. 1. 0. 0. 0. 0. 0. 1. 1. 1. 0. 1. 0. 1. 0. 1. 1. 1. 1. 0. 0. 0. 1. 1. 1. 1. 0. 0. 0. 1. 0. 1. 1. 1. 0. 1. 1. 1. 0. 0. 0. 0. 1. 0. 1. 0. 0. 1. 0. 0. 1. 1. 0. 1. 0. 1. 1. 1. 0. 0. 1. 1. 0. 0. 0. 0. 1. 0. 0. 1. 0. 0. 0. 0. 1. 0. 0. 1. 1. 1. 1. 1. 1. 1. 0. 1. 1. 0. 0. 0. 1. 0. 1. 1. 0. 0. 0. 0. 0. 0. 1. 0. 1. 1. 1. 0. 0. 1. 0. 1. 0. 0. 1. 0. 1. 0. 0. 1. 0. 0. 1. 1. 0. 1. 1. 1. 0. 0. 0. 0. 0. 1. 0. 1. 0. 0. 0. 1. 0. 0. 1. 1. 0. 1. 1. 0. 1. 1. 1. 0. 1. 1. 0. 0. 0. 0. 0. 0. 1. 1. 1. 1. 1. 1. 1. 1. 0. 1. 1. 1. 0. 1. 0. 1. 1. 1. 0. 1. 1. 0. 1. 1. 1. 0. 0. 1. 1. 0. 0. 0. 0. 0. 1. 0. 0. 1. 1. 1. 0. 1. 0. 0. 1. 1. 0. 1. 1. 0. 1. 1. So it seems this GPU does not outperform the CPU. Well,GT 750M may not be the best GPU you can get… Someone else here has a similar experience. After upgrading my MBP to OSX Yosemite and enabling TRIM, the computer cannot boot into the system after restart. It stuck with a no-entry sign. For me, I have to first use the disk utility to unlock my SSD first since I have Filevault enabled, otherwise the first command above will complain about “readonly” files. It starts apache for debugging and prints out the messages on screen, so that hopefully you can find something useful. After upgrading my Mac from 10.8 to 10.9 Mavericks my apache stopped working, so I have to reinstall mod_wsgi and mod_xsendfile. However, tricks are needed to compile and install these mods successfully. I had to manually upgrade Xcode (after Mavericks upgrade) from the App Store & agree to its license because ./configure hung forever until I did that. /dev/rdisk nodes are character-special devices, but are “raw” in the BSD sense and force block-aligned I/O. They are closer to the physical disk than the buffer cache. /dev/disk nodes, on the other hand, are buffered block-special devices and are used primarily by the kernel’s filesystem code. And now you have a normal sed! The fastest one can get via System Preferences is 2. You can set it to either 0 or 1, depending on your preferences. Hi, the company I’m working for (yabroad.com) is hiring Website Backend and Frontend Developers to our platform team. We are building an open platform for youngsters to travel beyond boarders and we offer youngsters internship, language study, travel and volunteer opportunities. Please contact me if you are interested. I installed XBMC on my Mac OS X Lion and every time I open up the program, a firewall permission dialog pops up. It didn’t help even if I added the XBMC in my firewall configurations. Popups still show up. 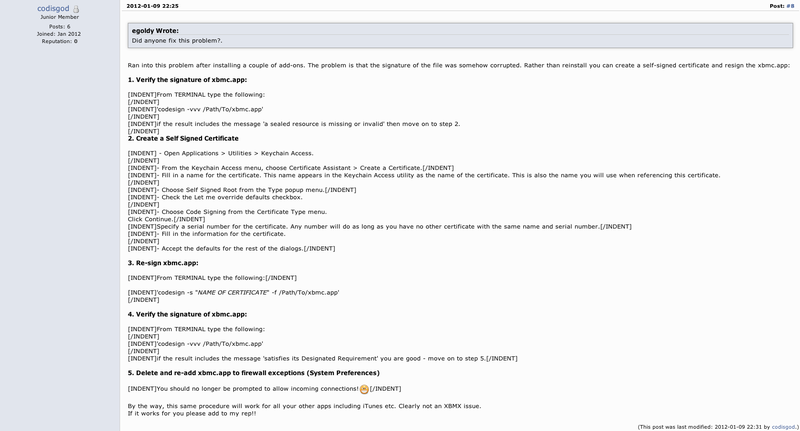 This link solves the problem neatly — You can generate a certificate and sign the program by yourself. After that the frustrating dialog should appear only once (at most). In case the link becomes invalid, here’s a screenshot of the instructions. Click to see the large picture. Jun 29 21:06:52 doh1 sshd: Invalid user postgres from 190.181.132.70 Jun 29 21:06:52 doh1 sshd: input_userauth_request: invalid user postgres Jun 29 21:06:52 doh1 sshd: Received disconnect from 190.181.132.70: 11: Bye Bye Jun 29 21:06:54 doh1 sshd: reverse mapping checking getaddrinfo for wimax132-70.yota.com.ni [190.181.132.70] failed - POSSIBLE BREAK-IN ATTEMPT! Jun 29 21:06:54 doh1 sshd: Received disconnect from 190.181.132.70: 11: Bye Bye Jun 29 21:06:55 doh1 sshd: reverse mapping checking getaddrinfo for wimax132-70.yota.com.ni [190.181.132.70] failed - POSSIBLE BREAK-IN ATTEMPT! Jun 29 21:06:55 doh1 sshd: Invalid user backup from 190.181.132.70 Jun 29 21:06:55 doh1 sshd: input_userauth_request: invalid user backup Jun 29 21:06:56 doh1 sshd: Received disconnect from 190.181.132.70: 11: Bye Bye Jun 29 21:06:57 doh1 sshd: reverse mapping checking getaddrinfo for wimax132-70.yota.com.ni [190.181.132.70] failed - POSSIBLE BREAK-IN ATTEMPT! Jun 29 21:06:54 doh1 sshd: reverse mapping checking getaddrinfo for wimax132-70.yota.com.ni [190.181.132.70] failed - POSSIBLE BREAK-IN ATTEMPT! Jun 29 21:06:55 doh1 sshd: reverse mapping checking getaddrinfo for wimax132-70.yota.com.ni [190.181.132.70] failed - POSSIBLE BREAK-IN ATTEMPT! Jun 29 21:06:57 doh1 sshd: reverse mapping checking getaddrinfo for wimax132-70.yota.com.ni [190.181.132.70] failed - POSSIBLE BREAK-IN ATTEMPT! I first tried to use DenyHosts, however, there are still attempts from other IP addresses. Since there are three of us accessing the repository, I configured the hosts.allow and hosts.deny manually: deny all hosts other than the IP addresses I trust. My mobile phone ran out of battery and the alarm clock didn’t ring this morning, but I still managed to get up just in time and caught the bus at the last minute — and arrived at the company at my usual time. My manager told me it looks positive to renew my contract and hopefully it will be one and half years. He also says he tries to get it done before the summer vacation, which makes my life a lot easier. Also he says it’s possible to save my holidays till winter. So I’ll be back in China for some time in winter this year. A very old lady managed to stop and got on the bus even though she waved her hand a bit late to the bus driver. The bus driver was polite and that what I like about Finland: people generally don’t get angry. Here’s one very funny and geeky picture I saw from xda-developers. In case the link gets invalidated later, the picture reads: “So, where did you two meet?” “Windows users: at the office” “Mac users: at Starbucks” “Linux users: GitHub”. I’ve had enough with the slow Preview application in Lion. After some digging I found this tutorial to downgrade the Preview in Lion to the Snow Leopard version. Basically you need to have a copy of both the Preview.app and /System/Library/PrivateFrameworks/MeshKit.framework from Snow Leopard. If you need to associate the default app to open pdf/png with the downgraded Preview, you have to delete the original Preview.app. Update: after installing OS X updates you need to remove the Preview.app again and put the SL Preview.app to /Applications/ directory. Yesterday friend and I decided to follow the MIT Operating System Engineering course together in order to get a deep understanding of OS’s. And today I started setting up the cross compling environment for the labs. At first I wanted to get the toolchain from macports, but unluckily it didn’t successfully build binutils on my Mac. As a result, I started building the toolchain from the source code, following the instructions at http://pdos.csail.mit.edu/6.828/2011/tools.html. Unzip them in a directory and build binutils, gcc, and gdb one by one. In order to build gcc, GMP, MPFR and MPC needs to be built first. Note that it’s essential to build gcc in a directory different from the source code directory to avoid compiling errors. When uploading with avrdude the plugin give a error prompt saying “Port already in use” (while no other application is using the port). After clicking OK it actually uploads the program to Arduino board. So I just copied the Arduino.app//Contents/Resources/Java/librxtxSerial.jnilib file to eclipse/configuration/org.eclipse.osgi/bundles/419/1/.cp/librxtxSerial.jnilib It works after restarting eclipse. No error prompts are shown.